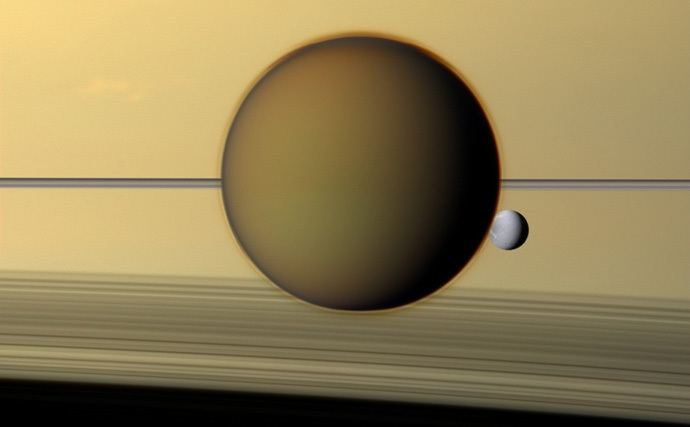 In what is one of the best images ever taken by the Cassini spacecraft, Titan and Dione hang in front of Saturn's rings. Like Earth, Saturn has seasons caused by the tilt in its axis. It's presently spring, in Saturn's northern hemisphere. The sun is behind and above the viewpoint, and the shadows of the rings are cast across the southern hemisphere. The image is in true colour, by the way, so it is exactly what you would see if you were floating in the observation cupola of a clipper outward bound from Rhea en route to Jupiter. On the night of the Northern Hemisphere's Winter Solstice, nine of my favourite films in which the story takes place over a single night. What did I miss? The crew of an isolated Antarctic base are infiltrated by a shape-changing alien. Unable to trust each other, they're picked off one by one as they try to stop the alien escaping. Yes, I know it begins in daylight, but the action really starts, with eye-popping SFX by Rob Bottin, as the stormy Antarctic night falls. Best moment: Touched by a hot needle, self-aware alien blood leaps out of a petri dish. Ed Okin (Jeff Goldblum) has a dull job, an unfaithful wife, and can't sleep. When he accidently saves Diana (Michelle Pfieffer) from Iranian thugs in an LAX parking structure, he becomes embroiled in a plot involving smuggled jewels. David Bowie appears as a private detective who mistakes Ed for a veteran player. Best moment: Stunned by narcolepsy, Ed watches an entire Cal Worthington commercial. One night, five cities, five cab drivers and their fares, and a Tom Waits' soundtrack. Best moment: Cabbie Corky (Winona Ryder) turns down casting director Gena Rowlands' offer of a part in a movie. She'd rather be a mechanic. Framed for a murder that threatens to trigger gang warfare, a small but resourceful gang, the Warriors, must cross hostile territories in New York to reach a midnight summit, their only chance to prove their innocence. A great action film from great action film director Hill, set in tough old New York. With a story loosely based on Xenophon's 'Anabasis'. Best moment: Warrior's leader Swan (Michael Beck) and gang-girl Mercy (Deborah Van Valkenburgh) meet cute. After cab driver Max (Jamie Fox) drops off lawyer Annie (Jada Pinkett Smith) he picks up Vincent (Tom Cruise), a suave businessman who turns out to be a suave hitman. As the paths of his two fares intersect, Max has to work out how to save himself and the last victim on Vincent's little list. Best moment: A coyote crosses the path of Max's cab, on an LA street turned into a ghost of itself by halogen streetlights. When New York cop John McClane (Bruce Willis) turns up at his wife's office Christmas party, he becomes the only man who can stop a terrorist plot. You know the rest. There's a famous scriptwriting class that uses Casablanca as an exemplar. If you want to write a script without a superfluous scene or line, study Jeb Stuart and Stephen E de Souza's adaptation of Roderick Thorp's novel. Best thing in the movie: Bruce's vest. A mixed bunch of people hide out from flesh-eating zombies in a remote farmhouse. Things don't go too well. Shot on a shoestring budget, it set the template for zombie and spam-in-a-cabin horror films every since. Has one of the bleakest endings of any film. Best moment: Involves a little girl, her father, her mother, and a basement. After Hours 1985 dir. Martin Scorsese. Word-processing drone Paul Hackett (Griffin Dunne) is plunged into a nocturnal Kafkaesque nightmare when he ventures into Manhattan's Soho to meet a girl he picked up in a coffee shop. Best moment: Paul is turned into a living statue, to hide him from a vengeful mob. On the worst night in the life of small town businessman George Bailey (James Stewart), apprentice angel Clarence (Henry Travers) demonstrates the worth of a life he thinks a claustrophobic dead end by showing what things would be like if he'd never been born. Key moments in his life are shown in flashback, so I think it counts. And the night in question is Christmas Eve, so hey. In his novel, Suspects, film critic David Thomson sets It's A Wonderful Life at the root of American noir. He has a point. Best moment: Cornered by cops on the bridge where Clarence forestalled his suicide attempt, a humbled George Bailey asks for his life back. And snow starts falling around him like a blessing. Outside the office window, a funeral cortege clip-clops past, headed by a carriage drawn by two black horses with black plumes affixed to their heads, drawing an open carriage in which the coffin lies inside a glass bier. Like the last resting place of Snow White. As William Faulkner once said, the past isn't dead; it isn't even past. Always useful for a science-fiction writer to be reminded of that. Working on a short story. After finishing a draft, I realised that it had been so laborious because it started in the wrong place. Which is why it was mostly back-story instead of narrative. You'd think, after writing some eighty-odd short stories I'd know by now where one wanted to begin. Lauren Beukes has assembled a reading gift guide from the recommendations of many of her interesting friends. I was very pleased to be able to recommend this wonderful collection of photographs. More here, and here. It may be cheeky of me to recommend one of my own books, but why not try this e-book collection, at a suitably cheeky price?